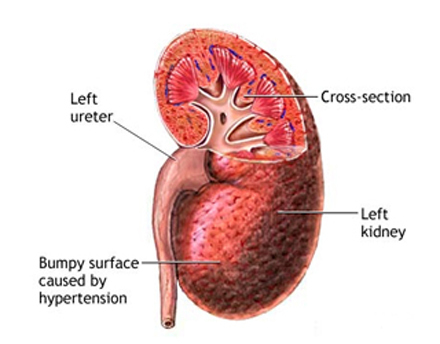 Renal Hypertension – Treatment India offers information on Renal Hypertension – Treatment in India, Renal Hypertension – Treatment cost India, Renal Hypertension – Treatment hospital in India, Delhi, Mumbai, Chennai, Hyderabad & Bangalore, Renal Hypertension – Treatment Surgeon in India. Renovascular hypertension is high blood pressure due to narrowing of the arteries that carry blood to the kidneys. It is a form of secondary hypertension. When the kidney arteries become narrow, less blood flows to the kidneys. The kidneys mistakenly respond as if your blood pressure is low and give off hormones that tell the body to retain salt and water. This causes your blood pressure to rise. Many different diseases can cause narrowing of the renal arteries. Hardening of the arteries from high cholesterol is one of the most common. Most patients have the typical risk factors for atherosclerosis, including high blood pressure, high cholesterol, and diabetes. Fibromuscular dysplasia is another cause, particularly in women under age 50. Usually, high blood pressure causes no symptoms. Occasionally you may have a mild headache. If your headache is severe, or if you have any of the symptoms below, see a doctor right away. These may be a sign of malignant hypertension. Persons with renovascular hypertension usually have severe, difficult-to-control high blood pressure. Elevated blood pressure measurements, repeated over time, confirm hypertension. Your doctor may hear a "whooshing" noise, or bruit, when placing a stethoscope over your belly area. Renovascular hypertension is often difficult to treat. Medications may be used to help control blood pressure. There are a variety of high blood pressure medications available. You and your doctor will decide which type is best for you. Everyone responds to medicine differently. Your blood pressure should be checked frequently. The amount and type of medicine you take may need to be changed from time to time. Further treatment depends on what causes the narrowing of the kidney arteries. In some cases, surgery to reconstruct the damaged artery may be done. Persons with renal artery stenosis may have a stent placed in the artery to hold it open. A surgical bypass of the renal arteries (revascularization) may be done to restore blood flow in patients who have severe high blood pressure, episodes of flash pulmonary edema, or rapid worsening of kidney failure. Call for an appointment with your health care provider if you think you have high blood pressure. Call your health care provider if you have renovascular hypertension and symptoms get worse or do not improve with treatment. Also call if new symptoms develop. Preventing atherosclerosis may prevent the development of renal artery stenosis. Lifestyle changes may reduce your risk of high blood pressure. Lose weight if you are overweight. Excess weight makes the heart work harder. Check with your doctor before starting a rigorous exercise program. Changes in your diet may help to control your blood pressure. Reduce the amount of salt (sodium)you use. Salt, MSG, and baking soda all contain sodium.